India's overall tablet shipments in the third quarter of 2013 (July-September 2013) crossed the 1.20 million (1,204,410 to be exact) units mark, recording a year on year growth of 9 per cent, and a more moderate increase of 4.7 per cent quarter on quarter- due to limited offerings from vendors battling Bureau of Indian Standards (BIS) certification guidelines. While the shipments were done by as many as 43 domestic and international vendors, only 13 vendors shipped in significant volumes of more than 20,000 units during the period. The top five vendors accounted for over half (58.7 per cent) of the total tablet shipments, according to a report released by CyberMedia Research (CMR). Note that CMR uses the term 'shipments' to describe the number of tablets leaving the factory premises for original equipment manufacturers (OEM) sales or stocking by distributors and retailers. In the case of tablets imported into the country, it represents the number leaving the first warehouse to OEMs, distributors and retailers. Also, CMR does not track the number of tablets brought on their person by individual passengers landing on India soil from overseas destinations, as well as tablets for distribution by the Government of India or state governments (as part of their social welfare schemes, scholarship programmes, etc.). Enterprises consumed around 20 per cent of total tablet PC shipments during the period July-September 2013. While there is no clear leading industry vertical where the adoption has been distinctly higher than others, going forward, Banking, Financial services and Insurance (BFSI), pharmaceuticals and retail are a few segments that are expected to take the lead. However, solutions-oriented original design manufacturers (ODMs) are most likely to rule the roost. 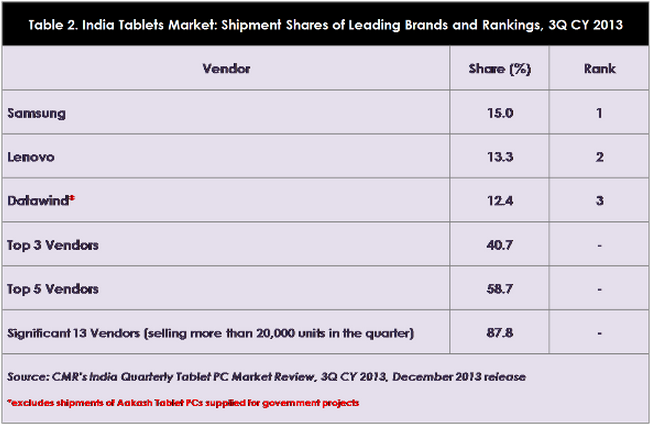 "Like the consumer segment, Android OS-based tablets dominate the India enterprise tablet PC space as well. But with more vendors committing to Windows OS-based tablets, the interest levels among customers are showing an increasing trend. In a couple of quarters, we expect Windows OS-based Tablets gaining significant traction within the India enterprise segment," said Faisal Kawoosa, lead analyst, CMR Telecoms Practice. Samsung maintained its leadership position with a 15 per cent market share. Interestingly, Lenovo figured for the first time amongst the top 3 India tablet PC vendors with a 13.3 per cent market share, while the controversy-driven Datawind came in at third position, with a 12.4 per cent market share. Note that Datawind shipments excluded the shipments of Aakash tablets, since those were a part of Government of India's low-cost tablet distribution scheme to students. "However, we saw quite a few vendors exiting the tablet category altogether, or launching their offerings in the enterprise tablets space. Key reasons for this are low profitability in the entry-level tablets market vis-Ã -vis a more promising future for growth of the enterprise tablets market," said Tarun Pathak, analyst, CMR Telecoms Practice. According to the report, the market is expected to pick up towards the end of the year, once tablet PC vendors are through with their BIS certifications. This is also expected to lead to some market consolidation, since only serious players with a long-term vision are likely to remain committed to this category of devices. "As far as technological trends are concerned, the 3G Tablets market will continue to grow and Android will remain the dominant OS, though it is expected to lose some share to the Windows and iOS platforms," concluded Pathak.